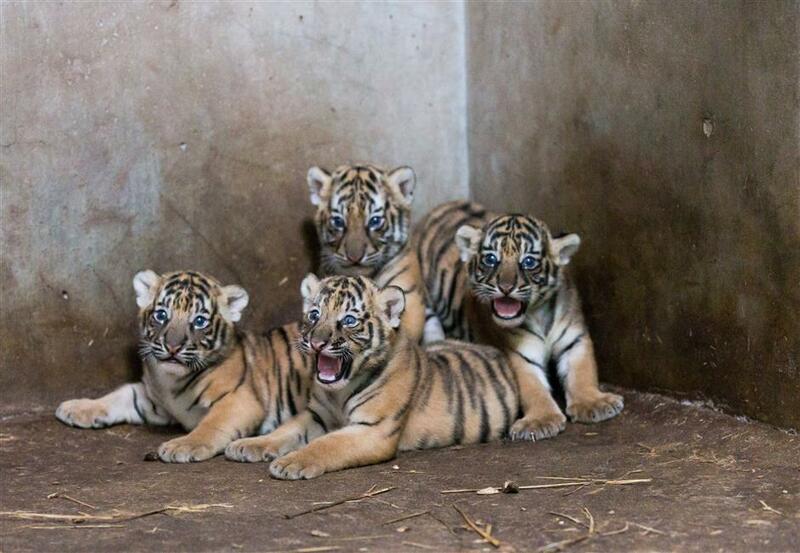 The Shanghai Zoo is asking the public to come up with names for four newly born Bengal tiger cubs. The cubs, two females and two males, were born on July 20. Their parents Yun Yun and Nan Nan were presented by southwest China’s Yunnan Province to Shanghai in July, 2016. Yun Yun is very affectionate toward tigress Nan Nan. The pair eat more than 5 kilograms of meat per day each, including beef and rabbit. When Nan Nan became pregnant, she was fed extra beef and fresh milk, and a “delivery room” was prepared. The tiger family are all in good health, and the cubs are well looked after by Nan Nan, who stays by their side all of the time. The four cubs can now walk around on their own. The heaviest cub weighs 3,660 grams and the lightest is 2,930 grams. At 1 month old, they are naughty and are curious about the outside world. The zoo is soliciting names for them via its WeChat account.